A bullish US President Donald Trump has proclaimed a "new American moment" as he delivered his maiden State of the Union speech to Congress. In a primetime address, the Republican leader said he was "extending an open hand" to Democrats to work together. The American economy is booming but Mr Trump's approval rating languishes. In an upbeat message a world away from his apocalyptic "American carnage" inaugural speech of just a year ago, Mr Trump said his administration was "building a safe, strong and proud America". "There has never been a better time to start living the American dream," he told lawmakers in a one-hour-and-20-minute speech. Nearly 46 million television viewers were expected to tune in as he implored the nation to come together as "one team, one people and one American family". "Tonight I am extending an open hand to work with members of both parties, Democrats and Republicans, to protect our citizens, of every background, colour and creed." But he insisted on a border wall with Mexico and other concessions from Democrats as part of any over-arching immigration deal. 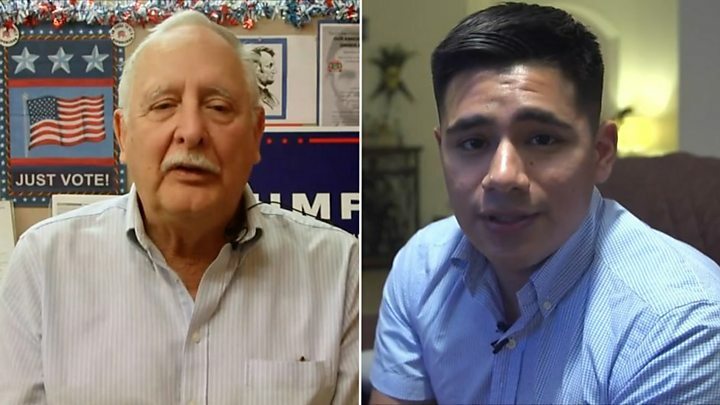 Media captionWhat did a Trump voter and a 'Dreamer' think of the State of the Union? Mr Trump again touted his pet plan to rebuild America's ageing roads and other infrastructure, though he did not offer many details. The president said that 2.4 million jobs had been created on his watch. The unemployment rate is at a 17-year low as the US continues its recovery from the recession of a decade ago. But Mr Trump's average job approval is jammed at 40%, according to Real Clear Politics. Bewailing a "fractured country" and depicting the Trump presidency as "chaos", Mr Kennedy, 37, said: "Many have spent the past year anxious, angry, afraid." "Bullies may land a punch," he said. "They might leave a mark. "But they have never, not once, in the history of our United States, managed to match the strength and spirit of a people united in defence of their future." 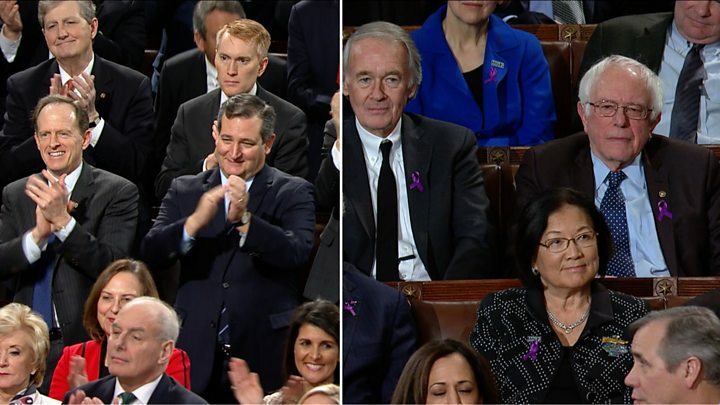 In one telling moment from Mr Trump's speech, members of the Democratic Congressional Black Caucus sat in stony-faced silence amid a standing ovation as the president noted African-American unemployment has hit a record low. Senator Patrick Leahy, a Vermont Democrat, said Mr Trump's appeal for unity, after a year of "divisive actions, petty insults and disgraceful race-baiting... ring hollow". 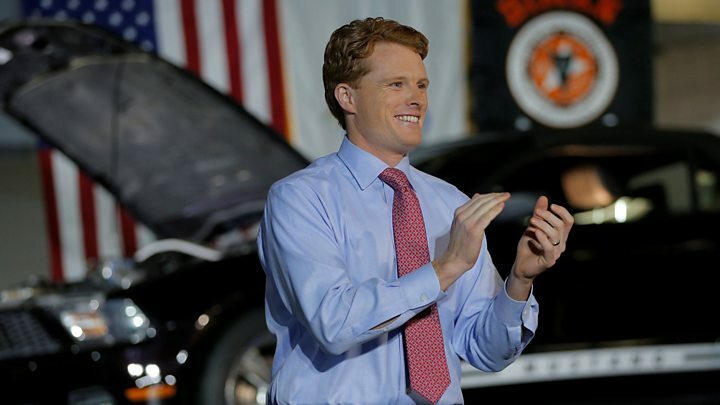 About a dozen Democratic lawmakers said they would boycott this State of the Union. You can tell a lot about a State of the Union address by where a president chooses to begin. On Tuesday night, Donald Trump delivered a polished speech that started by touting his economic record. Lower unemployment. Restored consumer and business confidence. A higher stock market. Mr Trump's poll numbers have lagged below the mark one would expect a leader presiding over a prosperous economy. The president, in his speech, set about trying to change that. The president's pledge to offer an open hand on immigration negotiations was surrounded by extended passages about immigrant crime and a veiled swipe that "Americans are dreamers, too". What did Mr Trump say on foreign policy? Mr Trump condemned "depraved" North Korea. He warned that Pyongyang's "reckless pursuit of nuclear missiles could very soon threaten our homeland. "We are waging a campaign of maximum pressure to prevent that from happening." "We will continue our fight until [the Islamic State group] is defeated," Mr Trump vowed. While his two White House predecessors have used their State of the Union speeches to forecast victory for American forces in Afghanistan, Mr Trump largely skirted what is now America's longest war. In an apparent acknowledgment of the deteriorating security situation there, he said the US "military is no longer undermined by artificial timelines". Mr Trump did not refer to the federal inquiry into whether his campaign colluded with Russia in the 2016 presidential election, a controversy that is dogging his presidency and which both he and Russia have denied.